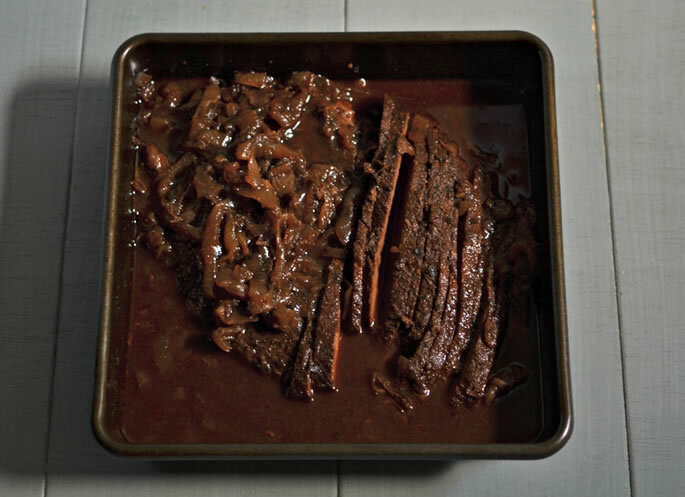 Somehow, brisket has become standard Rosh Hashanah fare across North America, so I would be remiss not to share my recipe as well as a few tips I’ve picked up along the way. Let the meat shine. Often people drown brisket in all kinds of bottled sauces, but I suggest saving that for cheaper cuts. 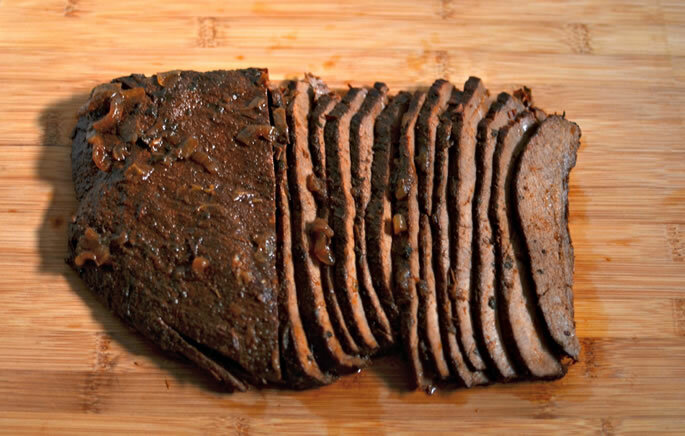 Use spices, herbs and milder liquids to enhance the flavor of the brisket. Patience, patience, patience! Cook the meat on a low temperature for a long time. Don’t try to rush it, or you’ll end up with hard, dry, chewy meat—not the pleasant, melt-in-your-mouth texture you were hoping for. Now, on to specifics. Cut the onions in rounds, and put them on the bottom of a baking dish. Mix the paprika, garlic powder, chives and salt in a small bowl. Pat the spice rub all over both sides of the meat, until it can hold no more. Now put the brisket on top of the onions and into the oven at 400° F for 1 hour, uncovered. Take it out and turn the oven down to 250° F. Pour ½ cup balsamic vinegar and ⅓ cup honey over the meat. It may look like not a lot of liquid, but the meat and onions both let out lots of juices, and you end up with plenty (as you can see in the pictures). Cover the pan tightly with foil and return to the oven. Cook for another 4 hours, until meat is fork tender—meaning a fork goes in with almost no resistance. Approximately once an hour take it out and turn the meat, so both sides get equally moist. (If you’re busy, you can skip the turning; just make sure to turn it once, about halfway through.) 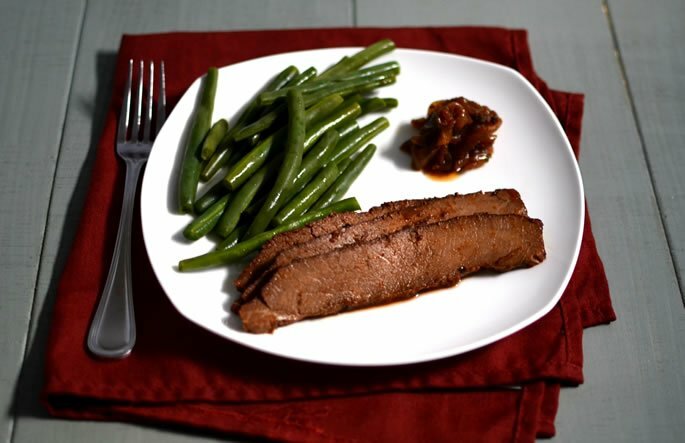 Cooking time will vary, depending on the size and thickness of your brisket, so make sure to use the fork test. Once it’s ready, refrigerate the meat overnight, then remove from the sauce and cut into thin slices, against the grain. Return slices to the sauce and reheat in the oven or over a low flame on the stovetop when ready to serve. Freezes well. Serve with the sauce and onions. Slice the onions in rounds. Place them in the bottom of a baking dish. Combine the paprika, garlic powder, chives and salt in a small bowl. 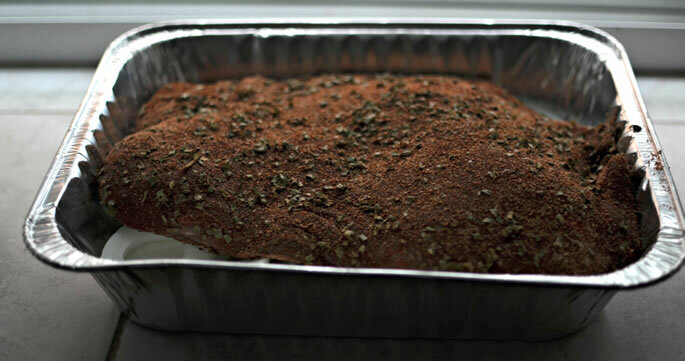 Cover the brisket with the spice mixture. Pat it in gently until the meat can hold no more. Place the meat on top of the onions and put it into the oven at 400° F for 1 hour. Take the pan out of the oven, add the balsamic vinegar and honey, and cover the baking dish tightly. Return the pan to the oven, lower the temperature to 250° F, and cook for another 4 hours, until the meat is fork tender. Refrigerate the meat until completely cold (preferably overnight), then cut in thin slices against the grain. Return the sliced meat to the sauce. Reheat in the oven, or over a low flame. Serve with the onions and sauce. Yields: Approximately 40 thin slices. 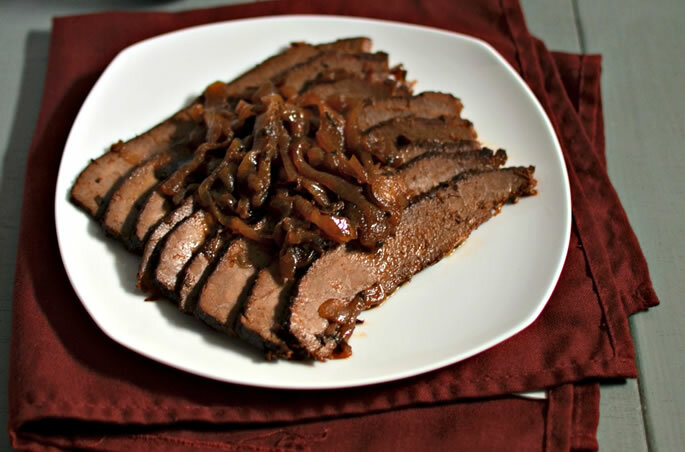 Do you eat brisket on Rosh Hashanah? How do you cook it? Any special family recipes? I am doing this for Pesach this week with an 11 lb - how much do I increase the seasonings by? Trying your recipe today. For a 6 lb. brisket, do you use 4 onions? Also do you separate the onion slices into rings, or leave them intact? I would add carrots but skip the mushrooms. You can add them to the pan with the onions at the beginning. I would probably slice them either in rounds or thin sticks. The carrots will make the dish sweeter though, so depending on your preference you may want to reduce or omit the honey. The brisket is a large piece of beef which most butchers separate into two cuts first cut (also called flat cut) and second cut (also called point cut). The second cut is fattier, the first cut is leaner. I prefer first cut. Both need to be slow cooked for best results. תודה רבה לך I just had to say Todah Raba! 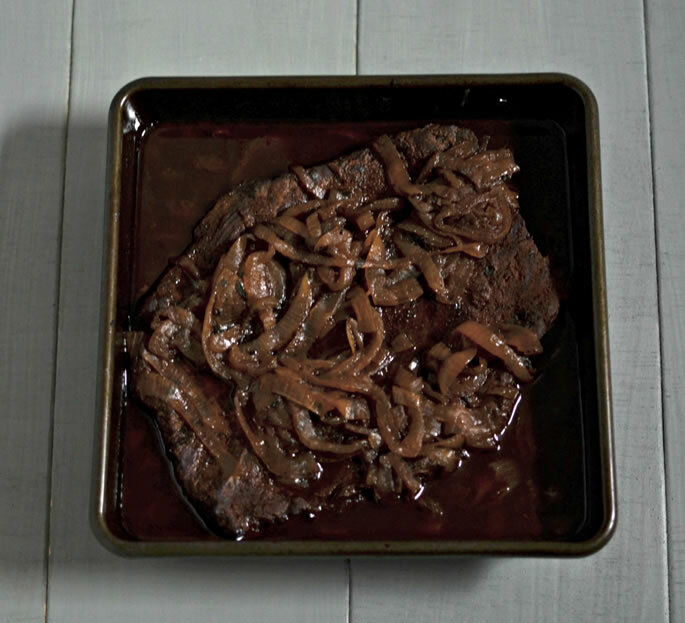 I have always made brisket the way my mother made hers and my grandmother before her, with catsup and dried onion soup and worcestershire sauce. For nearly 40 years, that's how i made it. But I have very bad acid reflux and can't eat anything with cooked tomatoes any more. I still made the brisket because my sons and husband love it, so I suffered. But now my son has the same problem, and I decided I had to find a recipe that wouldn't have us coughing and chugging Maalox. I admit that I was a bit apprehensive about trying a new recipe this Rosh Hashanah, but my goodness! No, YOUR goodness. This was the best brisket I have ever had. Everyone at the table raved about it; my son said it was "better than Mommom's." Higher praise I couldn't receive. Thank you very much, Paula! Calling me a good writer has me grinning widely!